The gripping new series from the writer-artist team behind the acclaimed JONNY DOUBLE continues, featuring painted covers by artist Dave Johnson ("The Justice Society Returns!"). 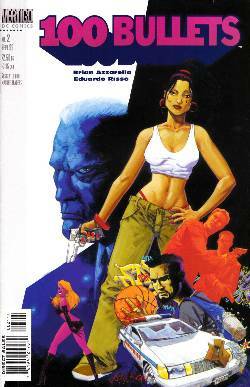 Given the opportunity and the means to avenge her family's deaths by the mysterious Agent Graves, Dizzy Cordova struggles with the morality of murder. Some folks in the 'hood however, don't have this problem. As violence erupts on the unforgiving streets, Dizzy comes face-to-face with her intended targets. Are they responsible, or was their crime just another random act that goes hand in hand with the thug life?